I wonder if it's possible to assign a "dynamic" color in storyboard. Since iOS7 you can use a tintColor and change it programmatically via the tintColor of the keyWindow. But I can't find a way to affect this tintColor to a button background for example. Which could allow me to easily have a way to theme my application. I thought of a crazy hack by using a category on UIColor and overloading the initializer to swap a specific color and use this color when ever I want a "dynamic color". I finally found the solution.. (had to wait for the tool to exist :p). Crayons is an Alcatraz allowing you to re-use some code define color in Storyboard! yeah! 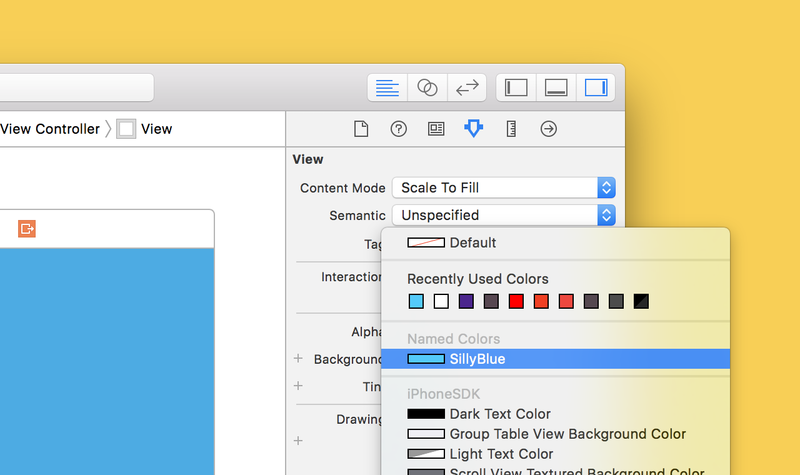 Using asset catalog colors in a Storyboard or an Interface Builder file is pretty straightforward. All color fields, including view background colors, label text colors, should display the colors you defined in the asset catalog under the “Named Colors” section. Not the answer you're looking for? Browse other questions tagged ios objective-c uikit uistoryboard or ask your own question.